Pittsburg has two inclined planes, which are elevators that will carry you up a hill. 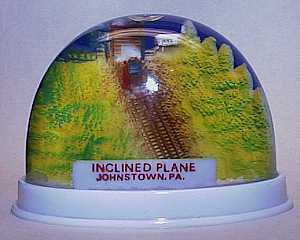 Johnstown only has one, but it can carry cars. We put our car aboard and rode up. At the top is (surprise), a gift shop! That's where I got this dome. I found this snowdome in a Walgreens drugstore less than a mile from home. Ironically, I had been in Downtown Chicago a few hours earlier at Navy Pier, which is the most visited tourist site in Illinois. They don't have this dome. 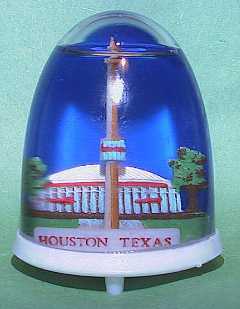 The same drugstore chain downtown doesn't have this dome. Odd. 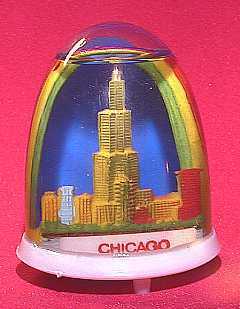 It's the best Chicago dome I've seen. No glitter. No black base. No stencils. It might be the last Chicago dome I buy. On my last trip through our airport, all the domes were black stencilled travesties. Tropical Storm Florence and I both blew into Houston on the same evening in 1998. I was there to fix a telephone office. Flo was there to make trouble. The telephone companies give us workers the midnight shift. Only you net surfers lose service if we make a mistake. As we finished up a few hours before dawn, the water was rising in the nearby bayou (say Bay-Yoo if you're a Texan) over the road. Very exciting. After three hours sleep, we hotfooted it to the airport, before all the expressways completely flooded. At the airport, I found this snowdomes, which made this trip a success for me.